Last week was not a good one for those of us living in the Tri-state area. Hurricane Sandy really hit us hard on the east coast and many people were left homeless or even worse lost their lives as a result. My heart felt heavy after seeing the many images of destruction on the news and Internet. It made me feel a bit guilty and very blessed that our house was not really damaged much during the storm. We were very lucky is that we didn’t lose any power as well. As the days went on however we were all pretty much stuck in the house. My kids had no school for entire week because it was cancelled. The post office was closed so it was difficult to ship anything for my business. And there was no gas at any of the pumping stations so we didn’t even want to drive anyplace. My husband was being cautious and said we should save our gas since we didn’t know when supplies would be back to normal. Last Wednesday was Halloween and I wasn’t even sure if I should take the kids out trick or treating. There were a few trees down around the neighborhood but no wires, since all the wires around here are underground. We figured it would be good to get the kids out and also give us an opportunity to check on our neighbors. We ended up going out with some friends and walked the neighborhood for about 3-4 hours. Pretty much all of our neighbors who answered their doors were very happy to see other people. I think every one around was experiencing a bit of cabin fever. Despite all of the trauma on the televisions it was great to see people smiling and being cheerful. The next day was Thursday and we had another decision to make. Thanks to US Family guide I had been offered to review the Big Apple Circus Legendarium that was playing by Lincoln Center in Manhattan. Our tickets were for the 6:30PM Showtime. My husband was weary about traveling from Queens into Manhattan. The news was saying that there was very limited subway service and that driving in was all but impossible. He was also saying he didn’t feel right going to the circus with all of this tragedy going on. I agree with him but our children thought otherwise. Our son said that, “The Show must go on”. I’m not sure where he heard that but in a way he was correct. If we were to sit at home all depressed we were not doing anyone good. Since the show was not cancelled all of the performers were sure to be there. And it would not be fair to them if they had to put on a show with no audience. So in the spirit of showing support and with the encouragement of our children we decided to make the journey into Manhattan. We heard rumors that the Long Island Rail Road would be working but when we got there no one could confirm. The woman working at the subway station told us the best way to get there was to take the F train and switch to the 1 at 42ndstreet. We waited for about 10 minutes for the F train to come to our stop. Since most trains were not running the F train served as a local instead of its usual express status. That made the ride in about 20 more minutes than usual. After getting off at 42nd street we walked over one block to the 1 subway. By the way all of the subways and trains were free due to the storm. We walked down to the subway platform and right away you could see it was very crowded. When the 1 train stopped at the platform it didn’t look like there was any room on the train. 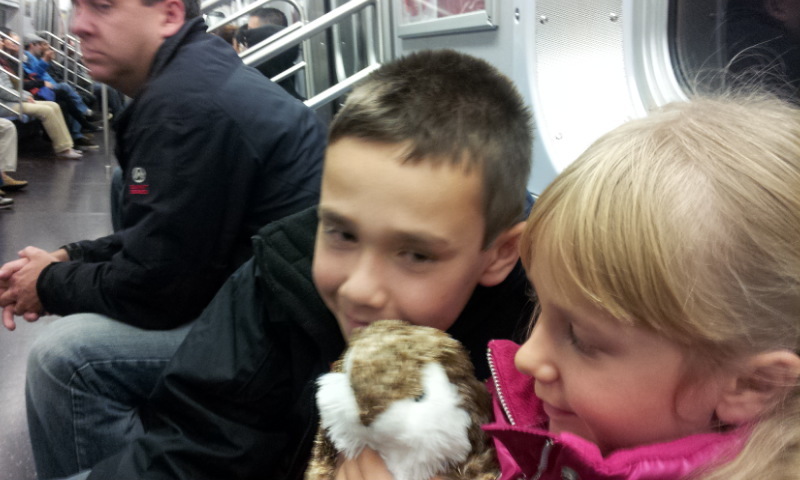 However we took the kids and crammed our way in, true NYC style. The train had to make several stops before we could get off. And at those stops more people crammed in to our subway car. It was standing room only and we all felt like a bunch of sardines. But you know I didn’t hear one person complain. 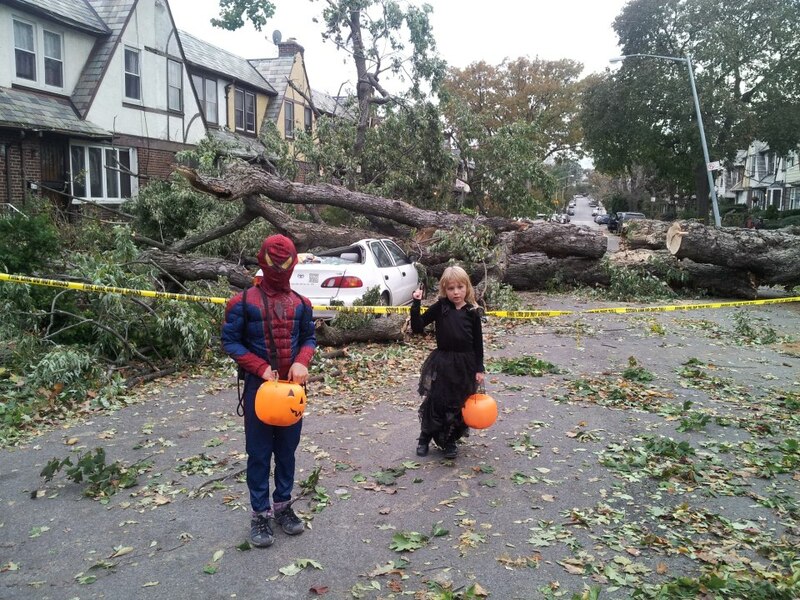 That is the spirit and strength of New Yorkers. After several stops we got off at the Lincoln Center Station. 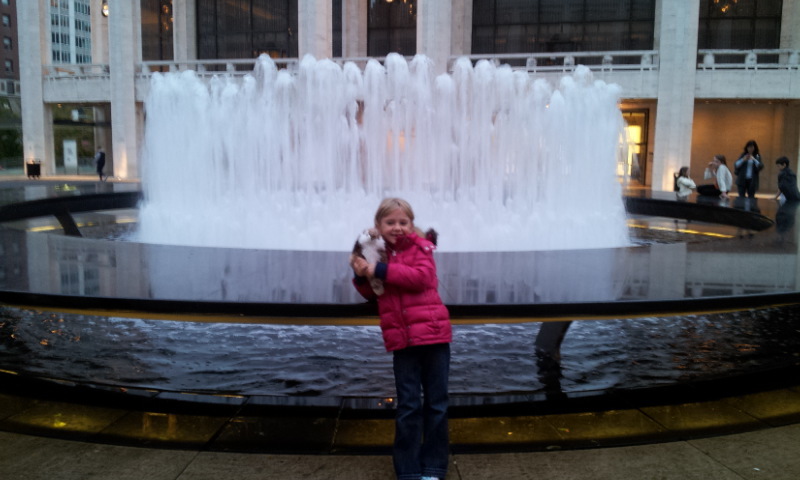 Coming up from the subway you could see the beauty and splendor of Lincoln Center. Aside from our son this was the only time any of us had been here. It was really beautiful and stood out from the surrounding buildings as an oasis of the arts. After walking for about a block of so we could see the large circus tents rising up between two of the buildings in the courtyard. Beyond the courtyards fountain you could see the spire and flag of the big tent for the Big Apple Circus. It was around 5:45PM when we arrived so we had some time before the show began. Going inside the entrance way we were pleasantly surprised to find out that the tents were well ventilated and heated as well. With the outside weather a bit chilly I was worried that the temperature inside the tents would be a bit cold. We went up to will-call to get our reserved tickets. After some difficulty of figuring out who’s name they were under the attendant was able to find ours. She smiled while telling us that they were some of the best tickets for the show. This was great to hear and got us all excited. We proceeded towards the main tent, which was through a series of smaller tents. On the way there we checked our coats and used the bathrooms. After that we went over to the big tent to see where our seats were. Just like the attendant had told us they were fantastic. The usher guided us down to the seats, which were three rows back, and center from the main ring. Well it was the only ring. 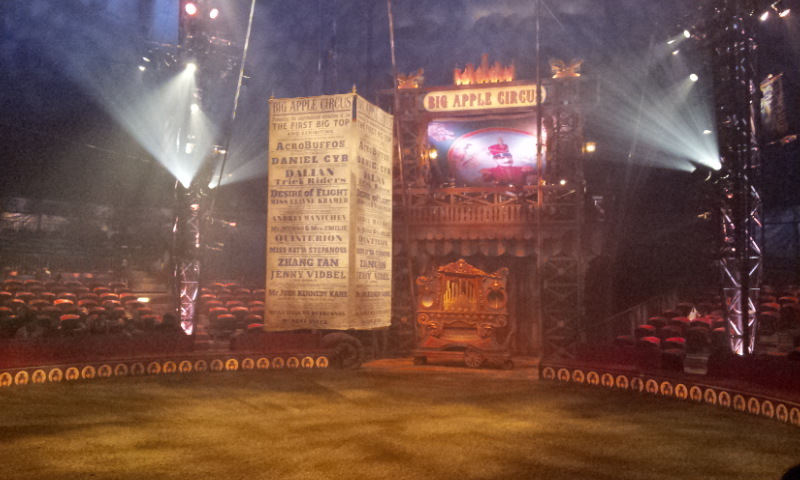 The Big Apple Circus is not a three-ring circus but a one-ring type. We would find out later that this led to a very personal atmosphere throughout the show. After getting some hot dogs, fries and drinks from the concession stand we went back to our seats to await the beginning of the show. At around 6:30PM the music from the circus band came blaring from the balcony and the ringmaster with top hat and all got the show started. The view from our seats was fabulous. And what I noticed from looking around at the other seats is that most people had pretty good views as well. The show opened up with Andrey Mantchev who did a solo Trapeze act. I was a little surprised when I noticed there was a safety harness attached to his waist. But then again as my husband pointed out there was no safety net below like usual. He was pretty skillful and it was a good way to open up the show. Next was the Liberty Horse led around by trainer Jenny Vidbel. She reminded me of the character from the Movie “Water for Elephants”. In between acts two clowns called Acrobuffos entertained us. 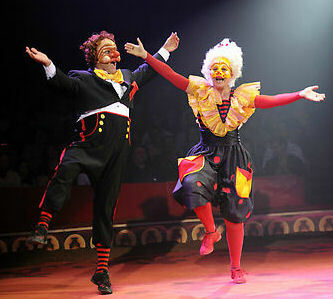 They were a woman and man clown pair that came into the audience at times to entertain and make us laugh. Some of what they did was hilarious while other stuff was not that funny. The next act was Elayne Kramer a contortionist. We witnessed her do things to the human body that I never thought was possible. She twisted her body like a pretzel and at one pointed suspended her whole body in the air by her teeth. She was simply amazing and certainly had the attention of my husband. I could only imagine what was going through his mind. Anyway this is a kid’s show so I will keep it clean, lol. After several more act there was a brief intermission of around 20 minutes or so. This gave us a chance to use the restrooms and stretch our legs. After the intermission there were about 8 more acts mixed in with the clowns as well. One of our favorites was Katerina who did a highflying twirling routine using long flowing silks. It was pretty amazing to see her up in the air like that. Also the Desire of Flight was pretty interesting. It featured a man and woman team of gymnasts who flew through the air while attached to straps. The final routine was called the Dalian Troupe. They were a group of Asian girls who did “trick riding” on bicycles. It was utterly amazing how these girls were able to balance on the bicycles while going around in a circle and doing jumps. Wow you really had to see it. Actually this is pretty much my theme for the entire show, “You really have to see it for yourself.” The Big Apple Circus Legendarium was one of the best shows my family has ever seen. I highly recommend seeing it when you get the opportunity. Disclosure: I received complimentary tickets to the circus to facilitate my review. All opinions and writings are mine and mine alone.